One of my favorite trends in the house of mouse is their live action sports section. In my opinion, they have made one great inspiring movie after another including Miracle, Million Dollar Arm, The Rookie and most recently McFarland USA which I especially loved. Some may view these films as trite and cheesy but I love them. They are the only thing keeping Disney small. Oh how I wish they would have a similar small animation department. 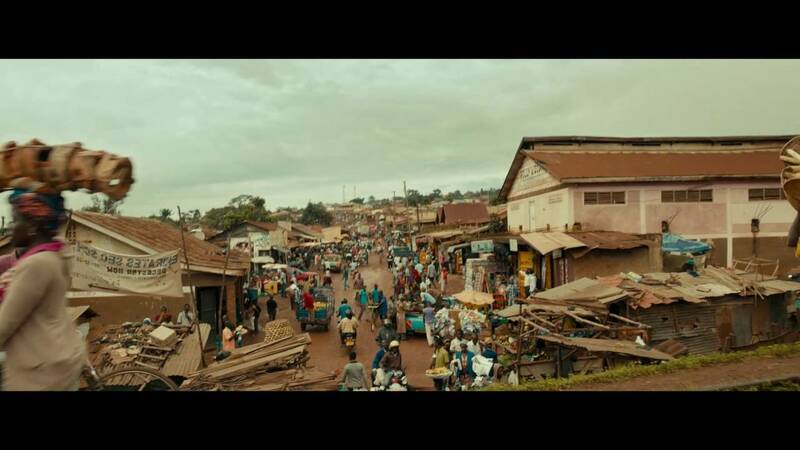 Their recent entry, Queen of Katwe, cost only $15 million and it is very special. I said on twitter about Queen of Katwe “If you like this kind of thing you will love it. If you don’t like this kind of thing, you might still love it”. I don’t know if it is just because it is about chess but if there was ever a sports movie that could please everyone this is it. Sure it hits the predictable ‘inspirational true story’ notes but then it also went places I didn’t expect it to go. 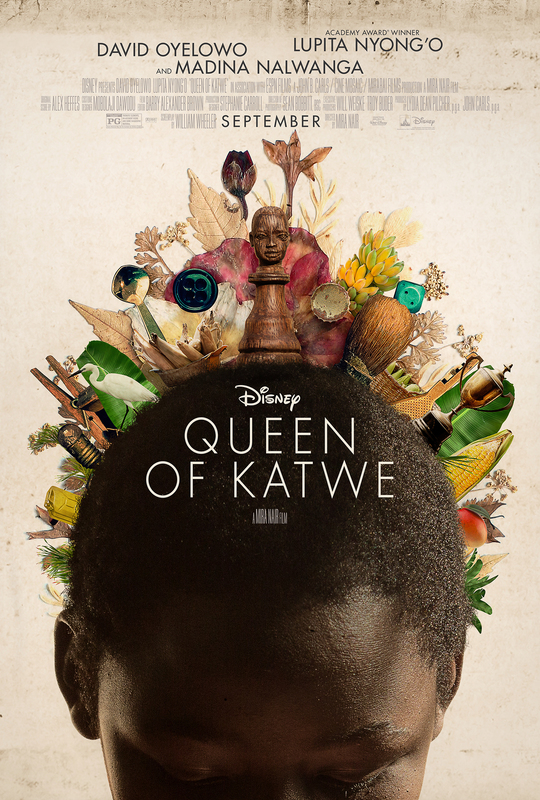 Queen of Katwe tells the true story of Phiona Mutes (Madina Nalwanga) a young Ugandan girl who becomes a chess master. She grows up in the slums of Katwe where she sells corn and other vegetables to make ends-meat rather than going to school. 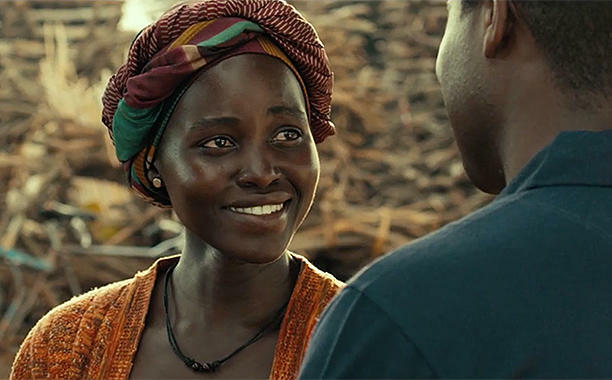 Her mother Nakku Harriet (Lupita Nyong’o) is a widow and trying desperately to keep her family together both spiritually and physically. 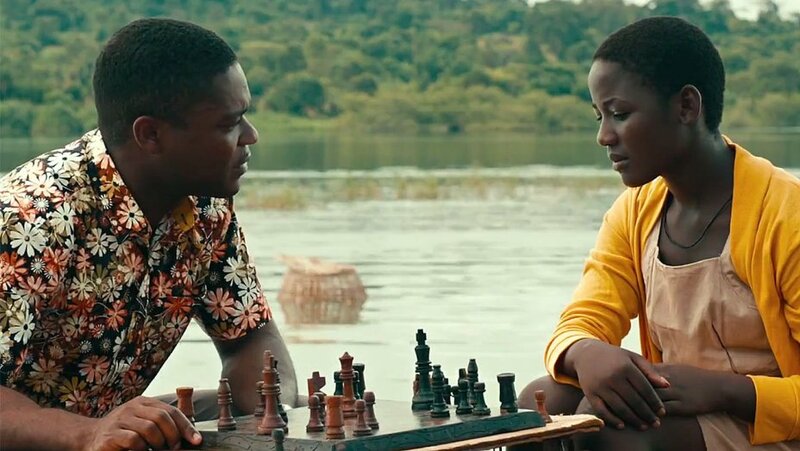 One day Phiona comes across an after school type group set up by Robert Katende (David Oyelowo) and she starts learning how to play chess. As she grows in her skills she also is taught by Katende’s wife how to read and think for herself. The movie does a good job showing the how hope can be a good and bad thing and how Phiona’s life isn’t anything but peaches and rainbows after her successes in chess. The slums aren’t sterilized for a Disney audience like you might expect. There is a landfill close and there is a devastating scene where a flood comes through and nearly takes Phiona’s brother away in the water. There is another scene where Nakku sells her mother’s dress to a skeevy man who propositions her, which I thought was pretty brave for a Disney film. 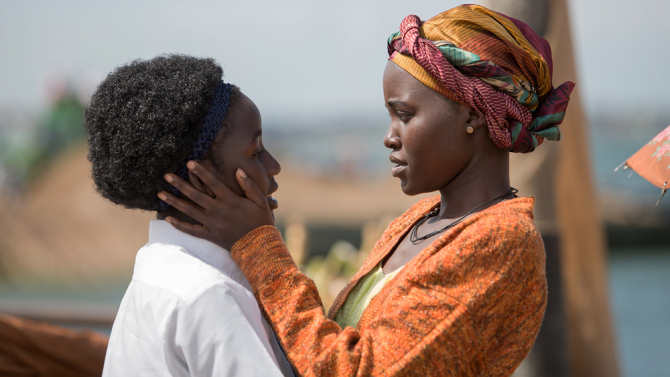 Lupita Nyong’o’s Nakku is not the perfect mother you might expect from this film. She is scared, gritty and weak at times. There is a brutal scene where her son is in a hospital and she can’t afford to pay the bill so she removes the IV and sneaks him out only to come to their shack and be evicted by the landlord. If that doesn’t pull at your heartstrings you have more self control than I do. It’s not just that these events happen but that I felt for these people. They felt real and whole with flaws. Madina Nalwanga is also excellent as Phiona who goes from shy and awkward to a bit of a diva to completely devastated and back around in the film. 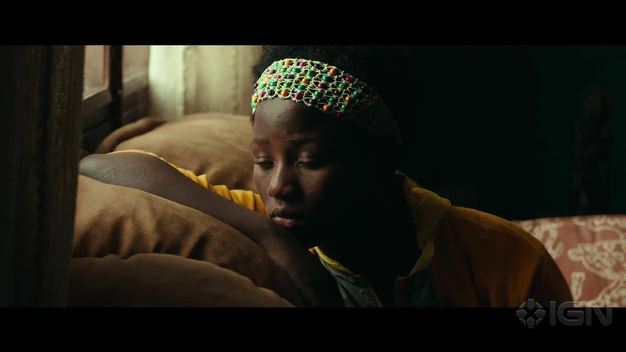 There is a devastating scene where she asks David Oyelowo’s Robert Katende if good things are for the city kids because things hadn’t changed and then he tells her about losing his mother. It was really moving stuff! Some will say this film is predictable and by the numbers but at least for me it went places I wasn’t expecting it to go. 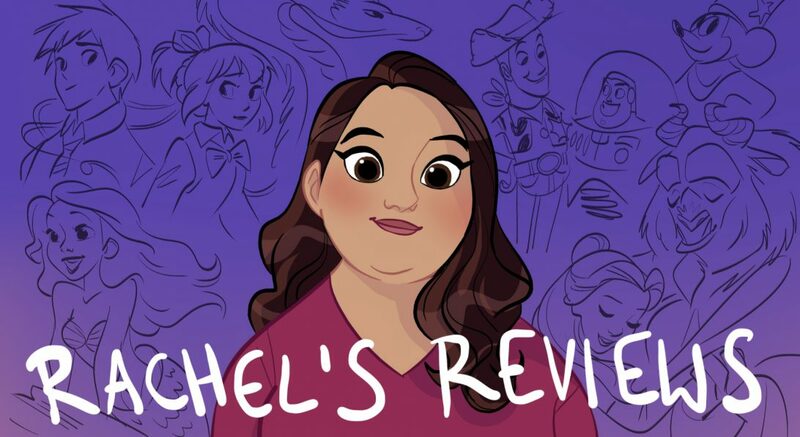 We learn about Phiona’s sister Night (Taryn Kayze) who is basically with a pimp for the lifestyle perks. Nakku is spiritual but not preachy. She is prideful but also weak, particularly when it comes to Night and Phiona. There’s a great scene where Nakku thinks her children are being trained to gamble instead of competing in chess. Nyong’o’s ferocity in that scene is awesome. David Oyelow is also tremendous as the chess coach who is real but also ready to give the pep talk. There is also basically no time spent with the rich kids bullying the Katwe teams. That was very refreshing. Also we get only a brief scene of the ‘jerk governing body embarrassed by the poor team’ like you typically get in these movies (think John Candy ‘they’ve earned the right’ speech in Cool Runnings). There are also basically no white people in the cast except a couple briefly seen chess competitors. So no white savior storylines this time around. Director Mira Nair has done a wonderful job taking the inspirational movie formula and creating something special. Go see it. I know you will love it! Also, I normally hate the ending scroll text in these movies telling you the rest of the story because it takes me out of the movie, but in this case I thought they handled it just right.